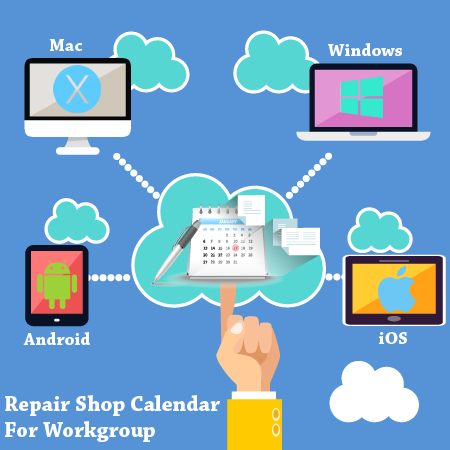 This is a more powerful version of Repair Shop Calendar, with all of the features of the standard version, but with the additional capability to share data in real time over the Internet. Let us host your online program! No need to install anything. We will host our web program for you in the cloud for lifetime! You do not need any IT skills to start using our web software. 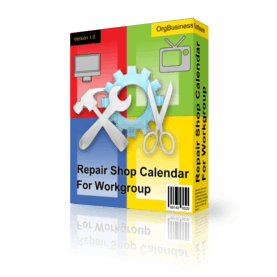 Repair Shop Calendar is a calendar for repair shops, dealing with cars, bikes, bicycles, home equipment, cloths and shoes. It’s perfect for repair technicians to plan their working hours so that the orders do not overlap, keep track of scheduled appointments and what service bay technicians will be using. It’ll store the information about the clients, such as their address, telephone, email and comments about a done repair job or a problem. There are two viewing modes in the program: calendar with a vertical and horizontal timeline and a table view to help you get the general overview of the jobs. Available is an automatic search and auto-field filling for a client, who has already been entered to the database. You can view the information about payments, daily income for any day at any moment when you need it. The program is designed to enable the communication between different scheduling applications. You can save appointments into an iCalendar file with the .ics extension. It facilitates data transfer between applications that use Scheduler and other applications, such as Apple iCal, Microsoft Exchange Server, Android apps. For those people, who work in Microsoft Outlook, it’s possible to synch data. You may obtain a collection of days which are considered holidays for the specific country, and add these holidays to the scheduler. In case of crashes or virus attacks, there is an auto backup function with a possibility to remove old archives automatically.